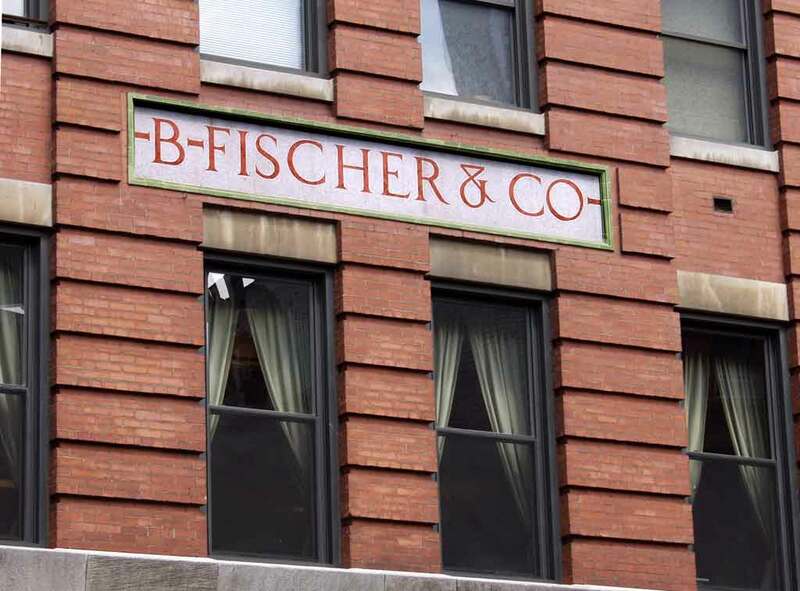 B. Fischer & Co. was formed in the late 1870s and dealt in imported spices, teas and coffee. The founder, B. Fischer, was Benedict Fischer (1840-1903), born 21 March 1840 in Baden, Germany, immigrated to the U. S. in 1855, became a naturalized citizen 1861, and died in New York City 16 March 1903. On his death the following appeared in the New York Times, 17 March 1903, pg. 9, "Benedickt Fischer, proprietor of the Benedickt Fischer Mills, 393 to 397 Greenwich Street, died in the Hudson Street Hospital yesterday from heart disease, with which he was stricken on a Ninth Avenue elevated railroad train last Friday morning. He was in his sixty-fourth year. Mr. Fischer was President of the American Encaustic Tiling Company of 1,123 Broadway, Vice President of the Mauser Manufacturing Company, silversmiths, at 14 East Fifteenth Street and 11 Maiden Lane, and a member of the Colonial, Union, and Merchants' Clubs and of the Liederkranz. He lived at 226 West Seventy-second Street." His life is summarized in the following on his Find-A-Grave entry, "Son of Bernhard Fischer & Carolina Beiser, he was born in Oberschopfheim, in Baden-Wurttemburg, Germany. He married Katharina Ebling on 21 Sep 1864; they were parents of 9 children, at least 5 of whom grew to adulthood (Antonia, Wm. H., Leonora, Florence, Irma). Benedickt came to the U.S. as a teenager, arriving in April of 1855 aboard the ship Mary Ogden. He tried his hand at several occupations, and found that he had some talent as a salesman. About 1860, he established a coffee, tea, and spice business (B. Fischer & Co.), and its Astor brand eventually grew to be nationally known. It continued to operate for decades after his death, and it still seems to be connected to the Winn-Dixie grocery chain. In the 1870s, he funded some experiments on tile-making using favorable clay deposits at Zanesville, OH. This eventually led to the founding of the American Encaustic Tiling Co., with Benedict as the President. It grew to be the largest tile manufacturer in the U.S. The company fell on hard times during the Depression, and eventually merged with another to form the American Olean Tile Co. (another nationally-known brand). AET tiles are still actively collected & traded on Ebay as of 2010. About 1890, he invested in the Mauser Mfgrg Co., and became its vice-president. Mauser was a silversmith company which produced very fine sterling silver. About 10 years after Benedickt's death, it became part of the Goreham Silver Co. Pieces of Mauser silver are still being collected & traded as of 2010. He also helped found the Riverside Bank, and was a large investor in real estate in and around New York. The family owned a country estate in New Canaan, CT, and they were mentioned on occasion in newspaper society columns. Benedickt died unexpectedly, on the elevated train on his way to work. Bystanders rushed him to a nearby hospital, but it was too late. He left a large estate, but by the 1930s the children had begun to squabble over it. Benedickt led a remarkable life, and he seems to have been unusually wise in his investments." A son, William H. Fischer (1867-1939), succeeded his father at B. Fischer & Co. in 1903. Wm. H. Fischer was born 1 February 1867 in New York City and died 18 June 1939, long after his retirement from the business. Well before William H. Fischer, however, Benedict Fischer's son-in-law, Charles E. Diefenthaler (1863-1948) was an important member of the Fischer enterprises. He married Benedict Fischer's daughter, Antonia Fischer (1865-1926), in 1886. Chas. E. Diefenthaler was born in New York City 9 May 1863, the son of Valentine and Catherine Diefenthaler. Valentine Diefenthaler was a tailor who emigrated from Hesse-Darmstadt, Germany. Charles Diefenthaler's brother, George Theodore Diefenthaler (1861-1944), was also a member of B. Fischer & Co., at least briefly in the early 1890s. He died in New York 30 April 1944 age 83. Another Diefenthaler at B. Fischer was George Edmund Diefenthaler (1881-1945), possibly a nephew of Charles E. Diefenthaler. His notice in the New York Times, 22 April 1945, pg. 36, read, "Chatham, N. J., April 21 - George Edmund Diefenthaler, an importer of coffee, tea and spices, died at his home here yesterday of a heart attack. His age was 63. Born in New York, he had been a resident of this town for thirty-five years. At his death he was president and director of B. Fischer & Co., Inc., 190 Franklin Street, New York, with which he had been associated for forty-eight years. He leaves a widow, two sons, C. Richard and David A. Diefenthaler, a flight officer with the Army Air Forces overseas, and four grandchildren." Another relative of the Diefenthalers who was an officer at B. Fischer was Theodore Oswald Budenbach (1876-1928). His father, Oswald Budenbach, married Catherine Diefenthaler, the sister of Charles E. Diefenthaler. On Theodore Budenbach's death the following notice appeared in the New York Times, 13 July 1928, pg. 9, "Plainfield, N. J., July 12 - Theodore O. Budenbach, 53, an officer of B. Fischer & Co., coffee and tea merchants of 190 Franklin Street, New York City, died today in his home at 714 Carlton Avenue here. He had been ill for a long while, and, for some time, blind. Surviving him are his son, Theodore Budenbach Jr., a sister and his wife. He was a member of the Shackamaxon Golf Club near Westfield." A photo of Theo. O. Budenbach appeared in Simmons' Spice Mill, December, 1916. This ad for B. Fischer & Co. appeared in The National Provisioner, December, 1905. The company not only imported spices, tea and coffee but also processed and packaged a variety of food products. B. Fischer coffee was sold under the brand name Hotel Astor Coffee, as seen in this ad from The Tea and Coffee Trade Journal, March, 1920. B. Fischer & Co. was formed in the late 1870s, but they were preceded by at least three earlier partnerships dealing in tea, coffee and spices. From the mid-1860s was Fischer & Thurber at 329 Greenwich St. with Abner D. Thurber. Another was Fischer, Kirby & Brown at the same address in 1869. Then in 1873 there was Fischer & Lansing, coffee roasters and spice dealers at 325 Greenwich St. George R. Lansing continued to work with Fischer at B. Fischer & Co. into the mid-1890s.